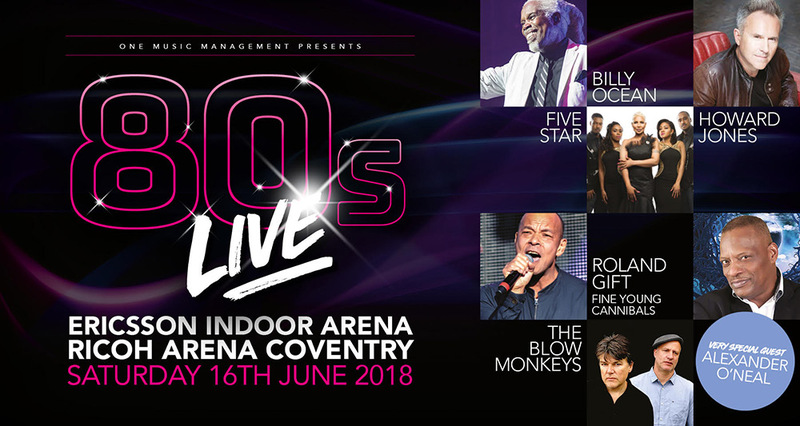 Ahead of the incredible 80s Live at Ricoh Arena, Coventry we caught up with Ian from One Music Management to find out more about what goes on behind the scenes at their events. How many people are on the team involved on putting on your events, and what do they do? We have a team of 6 people working on concerts and festivals. Working on everything from venue & artist liaison, to dealing with Press & Media. What other events have you been involved with? Our recent events include: The Solihull Summer Fest, Sean Paul Arena Concert, I Love Reggae Concert with Shaggy, Maxi Priest & Chaka Demus & Pliers and a Bob Marley theatre production “Marley Reprised”. What was the idea behind the lineup selection for this event? We wanted to cover a broad spectrum of 80's styles and select a few artists that do not always appear together on other 80s/Revival events creating a great atmosphere for the audience. Who's the best headliner you've event booked and why? Sean Paul was a great headliner! He was a pleasure to work with and a real crowd pleaser. Which other events inspire you? What's the most memorable backstage story from your events? Having to remove an artist from the festival who turned up 2 hours late, missing their stage time and then had to be removed from the site by security for causing a scene… and no I can't name them! Organic hummus, Ambrosia custard, raw cauliflower, Fiji Water… the list goes on!! Who's the best artist/band/DJ you've seen live and why? The best concert I have ever seen was Michael Jackson on his Bad Tour in 1988 (showing my age)! What's the best bit of tech you use at your events? The backstage radio system so that I can always know where Neil is! If we were attending your event, what should we expect to hear and see? At 80s LIVE you can expect to see some of the most memorable artists of the 80s performing their greatest hits all in one night. You won’t be disappointed with the production side too! At the peak time of an event I am usually stage side watching the artist perform and monitoring how well they are received by our audience. How has putting events changed over the years? Social media has definitely assisted with raising event awareness! Technology has also progressed with audio and lighting so you are able to put on some amazing productions! Stay up-to-date will all things 80s Live on Facebook and Twitter. Tier 1 Tickets are on sale now. For tickets and more information click here. We donated 1142 meals and we couldn't have done it without you!